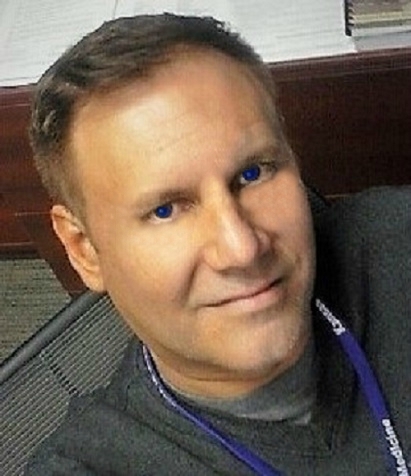 Dan Galbraith serves as the office manager/administrator for the Mosier Hall facility housing the ICCM/NICKS Centers at Kansas State University. In addition to updating the Anatomy & Physiology website and online directories, Dan serves as an editor and editorial consultant for faculty grant submissions, scientific manuscripts and other projects. Dan helped develop the department's rewritten and updated version of its constitution and bylaws, assisted in the development of the ICCM/NICKS Centers' 222-page Five-Year Programmatic Review for 2012-2017 and contributed to the Kansas Board of Regents Summarized Program Review of the Veterinary Physiology Graduate Program. He also helps facilitate daily management of the centers, providing leadership and a positive public relations presence with event planning and execution of hosting various conferences, meals and other programs; provides regular maintenance and troubleshooting for department equipment to ensure proper operation and longevity; and maintains department computers in an administrative role regarding software upgrades. Previously, Dan won 15 national and 76 state awards in humor writing, sports writing and photography during his journalism career, most recently working in an editorship role at The Packer, an international business-to-business publication and website covering the fresh produce industry. During his 10-year stint at that Lenexa, Kan. company, Dan coordinated assignments for up to 180 annual special sections, directed web and print news coverage as well as daily newsletter content, directed and coordinated the organization's social media posts and assisted with event/trade show planning. Besides performing the functions of the News Editor up to 13 weeks per year in addition to his other job responsibilities, Dan also ran The Packer's student internship program and proved integral in expanding it from summer-only to year-round. He did everything from searching for intern candidates to interviewing them, hiring them, training them and managing them, as well as other on-site, full-time employees and part-time freelancers who worked off-site. Dan also previously served in editor/hiring manager roles for Gannett Newspapers, the News-Press & Gazette Company, The Holton (Kan.) Recorder and The Sabetha (Kan.) Herald. He has also been a paid contributing author for the national best-selling "Chicken Soup for the Soul" book series. In 2015, Dan made an appearance as a featured guest star on the History Channel cable TV hit show "Pawn Stars," during which he interacted with store owner Rick Harrison. After going undefeated in singles play during his senior year of high school playing varsity tennis, Dan lettered in tennis at the University of Central Missouri and he still enjoys playing tennis, as well as softball, volleyball, basketball and golf.